Having already created one of the largest business districts in Europe, Canary Wharf Group is continuing to evolve London's former docks site by redeveloping a 23 acre site into 5m sq. ft of mixed use space. A sense of community, education and culture are at the heart of these plans, which include 2m sq ft dedicated to fast-growth businesses. To understand the impact of the site on London's tech and digital landscape, Wood Wharf will attract a larger number of tech jobs than in the entire city of Cambridge, concentrated into 23 acres. The multi-billion pound development is expected to generate £2bn gross value add from new jobs and £199m into the local small business economy. World-class architects and designers, such as Allies and Morrison, Allford Hall Monaghan Morris, Pilbrow & Partners, Herzog de Meuron and Heatherwick Studios, have been carefully selected to create a vibrant 24/7 urban environment with distinctive architectural appeal that answer the needs of the businesses of the future. From open spaces and waterside walkways to running trails and independent retail boutiques, the development is designed to attract tech, creative and progressive businesses of all sizes. The buildings, all with their own individual characteristics, all enjoy external terraces, dual power supplies, whilst targeting BREEAM "outstanding" and WeLL certification also offering the latest in smart-building technology. 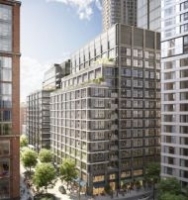 Wood Wharf has already secured forward-thinking businesses such as Ennismore, owner of The Hoxton Hotels group and The Office Group - taking over 180,000 sq. ft in total. Canary Wharf Group is currently in discussions with a range of tenants spanning the technology, cultural and educational industries. The ScaleUp Institute, the organisation mapping the UK's fastest growing businesses, cites infrastructure as one of the biggest challenges facing successful companies in Britain. Wood Wharf has been purpose-built to offer flexible workspaces and the opportunity for businesses to scale across the development. This is already happening across the existing Canary Wharf estate. Level39, the tech community with over 1,250 members, including eToro and Ripple, has become the home to start-ups looking to scale at pace. Previous tenants included both Digital Shadows and Revolut, the UK's latest tech unicorn, who have expanded into larger offices at Canary Wharf. Wood Wharf has also been designed to meet Canary Wharf Group's high sustainability standards. The development will be targeting zero-carbon and zero-waste and is being built to have a positive social impact on the local area and communities - 25% of the 3,600 residential homes will be affordable housing. Sir George Iacobescu, Chairman and Chief Executive Officer, Canary Wharf Group, comments, "Canary Wharf Group has reinvented London's business landscape once, and with Wood Wharf we intend to do so again for the era of fast growth tech and creative businesses. With the intention of creating 20,000 jobs, this will be a major investment into London's infrastructure and a home for the people shaping the future of this great City." Richard Archer, Managing Director Offices, Canary Wharf Group, comments, "Canary Wharf Group has engaged some of the world's leading architects and designers to create a new piece of London that will be purpose-built to encourage collaboration and growth for tech and creative businesses. Future tenants will enjoy the hallmarks of a Canary Wharf Group development - resilience, security and distinctive individually designed buildings - combined with public spaces, riverside walkways and a diverse retail offering. This is a business environment for ambitious entrepreneurs and scale-ups." Jacqueline de Rojas, President, techUK, comments, "London's tech sector has grown at an extraordinary rate over the past five years. Tech companies have consistently broken records in terms of investment, job creation and revenue growth. The city needs infrastructure to accommodate this rapid expansion and Wood Wharf seems the perfect environment for start-ups and scale-ups with global ambitions."